This exercise programme was used in the following pilot study and subsequent studies by the fit 4 surgery group in Southampton, led by Professor Mike Grocott. West MA, Loughney L, Lythgoe D, Barben CP, Sripadam R, Kemp GJ, et al. High/severe-intensity interval training (consisting of repeated short periods of high-intensity work and recovery) has been shown to deliver similar increases in markers of aerobic capacity (anaerobic threshold (AT) and VO2peak) with approximately 10 times less total work (and therefore over a shorter time period) than continuous endurance training (Burgomaster J Physiol 586:151-1609, 2008). 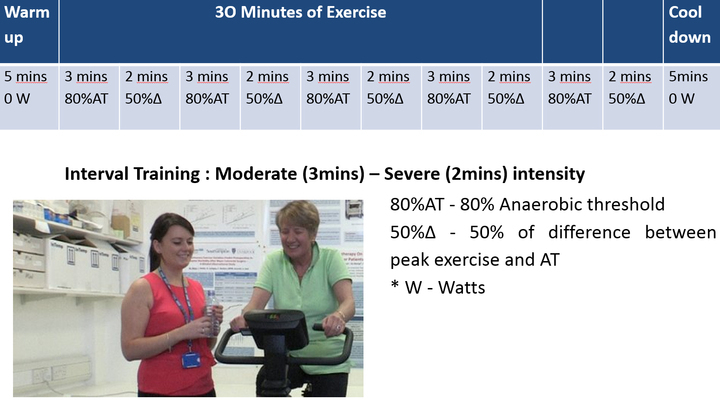 This supervised structured responsive exercise training programme (SRETP) has been successfully performed in hospital in the context of clinical trials. The programme is performed using a computer controlled, electromagnetically braked, cycle ergometer (Ergoline 200, Germany). In studies it has increased anaerobic threshold and VO2peak on average by physiologically and clinically significant amounts (1.5-3 ml/kg/min) over periods of 6 weeks to 9 weeks of training in cancer patients during or after neoadjuvant chemotherapy or chemoradiotherapy. 5 minutes of unloaded cycling is performed at the end of all training sessions for a cool down. 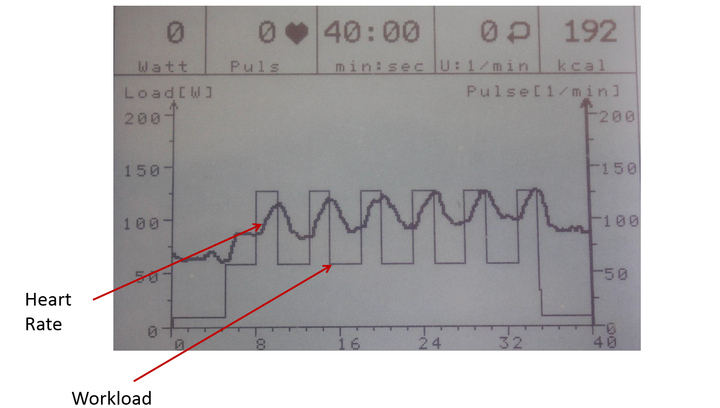 Blood pressure is monitored every 3 minutes throughout exercise and heart rate is recorded continuously from the R-R interval (Polar FT7, Warwick, UK). A standard CPET test is performed to monitor the progression of training-induced improvements in physical fitness every three weeks. The absolute power output for subsequent training sessions is adjusted according to the outcome of CPET test. Exercise sessions can be terminated by the patient at any time, and are terminated by the supervisor of the test if any of the criteria to stop the test are met, based on the ATS CPET safety guidelines.